B eautiful NEW necklace from Fossil. 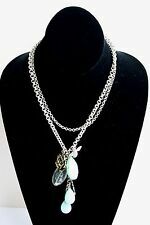 It features a silver-tone link necklace chain with semi precious aqua stone accents and a butterfly and bird charm; This necklace has a lobster claw clasp closure. 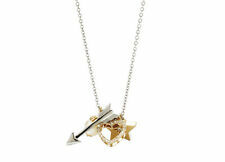 Hit the mark with this charming star, heart, arrow and pearl necklace from Fossil. Wear them together or separate -- it's the perfect gift to give to a friend. The Look:Polished steel bow and gold-tone arrow with grey crystals. If you like their belts and accessories, you will love the jewelry. 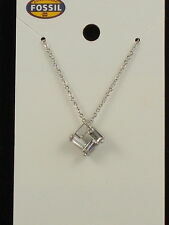 This great necklace features a fine silvertone chain with a square pendant with clear baguette stones. 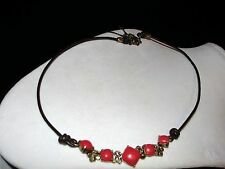 Brown Leather Cord Necklace with red/orange stones. If you like their belts and accessories, you will love the jewelry. Logo F embossed lobster claw style closure with a Fossil logo heart lock, key and logo embossed stone. We'll be happy to help you find just the right designer fashion piece for your needs. We are professionals, friendly and courteous and will treat you with the care and concern we value. ROSE, TREE, BEE AND WISH CHARMS. TURQUOISE, CLEAR AND LIGHT BLUE STONES. DOUBLE FRENCH HOOK CLOSURE. SILVER TONE CHAINES. If you like their belts and accessories, you will love the jewelry. This necklace is from the Drama Color Collection features a goldtone chain and settings, bight blue and green glass set stones, topaz crystal cup chain down the center, and classic lobster claw closure. Nwt Fossil Sterling Silver Round Solitaire CZ Clear Stone Pendant Necklace 16"
Nwt Fossil Sterling Silver Round Solitaire Clear Cubic Zirconia Stone Pendant Necklace. Clear Cubic Zirconia Round Solitaire Pendant. Sterling Silver Circle Link Chain Necklace. 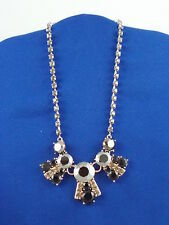 Stainless Steel Necklace 16" Long. Style # JF16921040. Charm made of Sterling Silver and 10 Cubic Zirconia Stones. 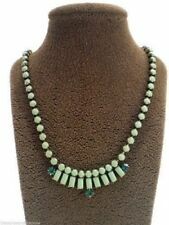 The necklace cord is made of polyurethane. Easy to open silver clasp. Authentic Fossil Necklace with Charm Made of Silver and Cubic Zirconia Stones. 100% AUTHENTIC FOSSIL SILVER GOLD 2 TONE,ARROW,PEARL,STAR,HEART,CHARM,CHAIN NECKLACE JF00638998.